When Tori Spelling and husband Dean McDermott sold their house in Encino last year, I just kind of assumed it was because they wanted a bigger place for their growing family (baby Hattie was born in October). Instead, they downsized to a smaller, more modest 2,300 square-foot house in Malibu. Not that there’s anything wrong with that. It’s kind of refreshing, actually. Take a look and see what you think! Their former home had 6,700 square feet with 6 bedrooms and 6.5 bathrooms, so they’ll have about a lot less space in the new place–not to mention 3 fewer bedrooms. It’s near Point Dume, which is where Howie Mandel’s house is that we looked at last week. The house sits on nearly 2 acres, so they’ll have plenty of room for all of their animals to run around. Tori says she wants to grow their own food on it, too. Tori just wrote a post on her blog about the reclaimed-wood floors they installed in the new house. They reportedly paid $2.4 million for the new Malibu pad. Are you as surprised as I am that they downsized this much? I’m sure Tori will use her mad decorating skills to transform this place into something special. I just hope we get to see the results! P.S. 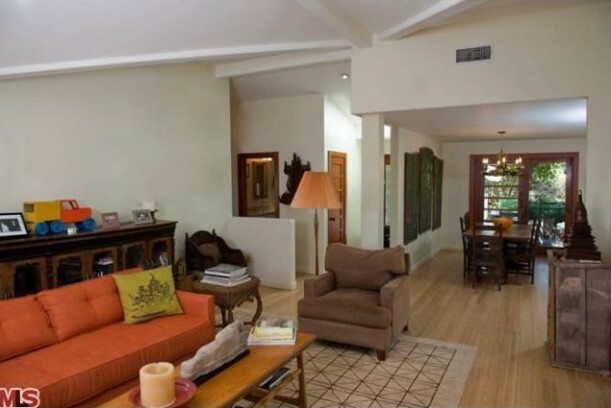 You can see pics of Tori and Dean’s former home in Encino here. I especially loved the makeover she gave their family room. seems a little strange for a celebrity of all people to move into a house that size…but i have to say i like her more for it! go TORI!! All I have to say is location, location, location. What is the pink doll looking object in the mirror of the bathroom? I can’t see what it could be reflecting, but it definitely looks like it has a head. It will be interesting to see what they do with it. Interesting that they downsized by that much! Love the house and I think it will make a great home for Tori, Dean, and their brood! Can’t wait to see what they do with it! This could be a really great house with some love and decorating sense. It’s obvious she is not her mother. How refreshing to see a family of that size and with that kind of money living in a modestly sized home. I love to see that! Do you know what the old place sold for? Any chance they’re trading size for location? I would have to think Malibu is a lot more expensive than Encino. They reportedly sold the Encino house for $2.5 million, and the Malibu house was $2.4. I love the choice and hope we get to see what some good decorating does to the place. I wonder if she enjoys being close to her family and spending time hanging out together since everyone was probably totally isolated and spread out in the Spelling mansion growing up. Interesting to hear about her installing the reclaimed wood floors…I figured for 2 acres in Malibu, she was going to tear this place down and start from scratch. My thoughts exactly. Except she installed those floors, so I would definitely put money on an addition remodeled onto the home real soon. That’s a great deal for Malibu, especially when getting 2 acres as well. All those houses there and along PCH seem to be bought, and then gutted or added onto fairly quickly. We used to drive through there every Sunday when I was a kid and the housing landscape never seemed the same! I think Tori and Dean are fantastic. Looks like they made a good investment and it will be fun to see what they do with the place! I love the fact that they downsized (especially considering the size of the home she grew up in). I find it disgusting that stars will buy 20,000 square foot homes for 2 people to live in (along with a maid, etc). I have more respect for them after seeing the house that they bought. They sound like one of the many Hollywood couples who say that they want to raise their children to be grounded, but have actually followed through! This isn’t a big guess, I see a major over-hall in their future. I wonder if the will keep the animals outside in this house? I really admire and love Tori and Dean for who they are and the way they seem to be raising their children. Good for them! Check out the show if you haven’t…..
Don’t like the house at all and the interior decor and furniture looks like local garage sale junk. Why buy such an ugly house and what happened to all of her beautiful furniture? You could just see in Dean’s face and voice that he really did not like the house at all but Tori pulls the $$$ strings. He always sweet talks her and is so obedient enough to make one barf and calling her mama, babe and T makes him so subservient. Grow some b…s Dean. I totally agree nobody down sizes that much unless they must, i can’t believe this, is their new home next to a store or warehouse? the furniture is unbeliveably bad. I predicted that as soon as he has enough “legal” husband years under his belt, that eventually he is going to take her for ALL she’s worth, and it’s A LOT. Sorry, but I just don’t buy them as a real husband and wife at all. Reality show, yes! Husband and wife, no! It’s obvious that he’s gonna dump her in a few years, and she’s gonna have to shell out some HUGE bucks to him, because she’s the one with all the money, as well as half of her mama’s money too. I would imagine that Tori’s father established a huge trust fund for both and her brother, which she stands to inherit at a certain age, if she hasn’t already. And Tori also stands to inherit half of everything when he mother passes away, so Dean is no dummy. He has everything planned out to a “T”. You watch, mark my words. Dean is going to leave her at the just right time. He won’t spend one more night with her then he has to. It’s pretty clear what he has planned. Not only that, but he is going to bide and use this time well, and completely to his advantage. He was a nobody in L.A., until he hooked up with Tori. No one even knew his name, who he was, or what he had done. But he sure knew what the name “Spelling” would do for him and ALL the doors it would open for him, and it sure did, huh? He knew the name “Spelling” would open all of doors for him that had otherwise been locked. No one had even heard of this guy before he latched onto to Tori’s coat tails. Boy, he probably thought he hit the Mega-Lotto jackpot when he landed her. LOL-LOL-LOL. Poor Tori, she’s just oblivious to this guys schemes. She’s living in a fools paradise and doesn’t even have a clue what this guy is going to do to her in just a few short years, and I can’t wait to see it. LOL-LOL-LOL-LOL!!! And Dean is only to happy to knock her up as many times as possible. He knows Tori is his own personal entitlement program, and just like ALL the millions of other lazy welfare recipients who SCAM the taxpayers in this country every year thanks to Liberal idiot politicians, he knows that the more kids they have the more money he’ll get in the divorce settlement. Man, oh man. I bet he just ecstatic every time she get’s knocked up. I know exactly what he’s doing, and why he’s doing it. This guy is a total maggot, jerk, and a ……… well I can’t say here or you won’t post what I REALLY want to call him. He is SCUM. What kind of rotten, vile, despicable, reprehensible, and no-good pig CHEATS on his unsuspecting, faithful, and loving wife of 12 years, AND then turns around and ALSO weasel’s out of his promise, duty, and obligation to go forward with the adoption of a beautiful little baby girl they were in the midst of legally adopting together when he decided to CHEAT on her?? What utter, total, and complete trash this guy is, and he got everything he deserved when he wrecked on his motorcycle. Too bad it didn’t knock some brains, sense, and compassion into him, because Lord knows he has NONE at all!! I have NO use for this piece of garbage at all. I think he is lower then low. Once a CHEAT, always a CHEAT. This is what he will do to Tori too, and she deserves it. It is sooooooooooooooooo obvious that he’s going to do this Tori, and she deserves it too for her role in it. Notice he didn’t have a bunch of kids with his first wife and they waited years to have only one (1) son. So it’s obvious why he’s having so many kids with Spelling. He didn’t have a bunch of kids with his first wife, he only had one (1) kid with her, and they were together a lot longer too. The guy is a pig, absolute scum. Much better location. I say Bravo for downsizing. I know Tori will do a number on the house and it will be transformed. I too hope to see the “after shots”. I’ve never watched their show but I think it’s sweet that they want to raise their family to be close. It doesn’t seem to work out that way often with families that are famous. Kudos to them and I’m looking forward to seeing what they do with it. How normal! I hope hey find happiness there. How refreshing. She grew up in that rediculous mansion. Probably wants to live a more normal life. Love that! I absolutely LOVE it! Bigger doesn’t always mean better. She’ll do an amazing job of making it home for her family. Can’t wait to see after pics! I am going to enjoy watching this family and their evolving homelife. Sounds like Mom has some real sense of family and what closeness can mean. Recall of her childhood? Tori & Dean made an excellent choice with that modest rancher on 2 acres! I love the house the way it is but I’m sure Tori will make it even more fablulous! Besides, with 2 acres, they could always add on if they need more space. I have to say that ms. Tori sure has a lot of gumption and ambition. Her energy AMAZES me – and now she has three kids! What, no gift-wrapping room?!? Kidding, only kidding Tori!!! It’s a darling little house! It’s cheerful and homey and good Lord who needs a gift-wrapping room when your whole life and those three beautiful children are all the “gift” you’ll ever want. O.K. This is like a joke isn’t it? But if they fix it up and don’t tear it down and build a McMansion we real people will get some great tips for what to do with our places. Looks like the houses in my neighborhood-just drop a zero from the price tag. I have a not-so-secret love of Tori Spelling (probably all of those horrible/awesome Lifetime movies). This home seems to definitely have the potential to be pretty incredible! I like Tory and Dean’s new downsized home except for that narrow room just for their bed. There’s barely room to get in and out of the bed. I’m sure Tory will fix that somehow though. My heart leapt with joy looking at the large bookcase in one room, filled with books tat aren’t arranged “for show” but which seem to be used and loved. This house seems charmingly cozy and not at all pretentious. Some of the furniture seems vintage. Considering the extreme glam of her childhood, I bet she yearned for a “normal” home. Good for her, bucking the crowd. Good for them. The locations is fabulous, and they have plenty of room to add on if they need it. I have seen the house that Tori grew up in and it was like a very large hotel. You could get lost, really lost, not a metaphor! This new house has plenty of potential. I’m not a celebrity follower and have never watched a ‘reality’ show, but good for her! I find it interesting that even celebrities are figuring out that huge spaces don’t encourage family togetherness. I wonder if they’ll be able to resist not adding on? Still, 2 acres in Malibu is not shabby. I’m so glad you featured their new home, we didn’t get to see enough of it during the ending of their show this season. I think it’s awesome they wanted something smaller for their family, and can’t wait to see what they do with it! Good for them for downsizing to a smaller house. Sounds like they will have a great time living there. Extremely refreshing. The weird layout of the master and other areas only means they are going into a “normal” home that will need some updating and happy love to help it out. Plus, they have 2 acres to do an addition if needed. Great great! I’m wondering if they plan on tearing the house down and bought the property for the prime two acre location. They’ll have plenty of room to build something a little roomier and not sacrifice much of the land that they’re on. Or maybe they’ll do an addition and remodel. I can’t imagine that they’ll just remodel the existing floor plan. I really have a feeling they bought the property because of the 2 acre lot and fabulous location, not because of the wonderful house that occupies it. I think it’s great that they’re downsizing and I agree with you…I sure hope we can see shots of the house once Tori redecorates! I loved what she did with their Encino house. That is a totally NORMAL house (other than the price tag, which as someone pointed out is all about location). I’m sort of intrigued by it, actually. Watching “Selling Spelling Manor” I was really so sickened by the disgusting excess of it, so this makes me actually feel sort of warm and fuzzy about Tori, that she wants her family to have the polar opposite of what she had growing up. I LOVE seeing celebrities downsize. That never happens. Hats off to them! I think she will make this home. A smaller house on a large lot may give them more privacy. With a large lot you can add on or bump out spaces to make them better. also decks, porches and sunrooms can give any house more elbow room. Do I hear a vote for a great sunroom here? I can’t believe they downsized so much! Of course the location is a whole ‘nother factor. What a difference from her previous home! Tori definitely has a knack for decorating, so hopefully she will spruce it up. Seems odd to me. I would have gotten something between 6500 and 2300 square feet, so I guess around 3500. Maybe they’re planning to add on. Tori probably needs a room sized closet for herself! I hope we get to see the “after”. Wow, I’m a little underwhelmed, but I probably have more respect for her now. I’m sure it will be beautiful when she’s put her own touch on it. I suppose I am surprised, but I certainly applaud it! Kudos to them! I don’t watch their show, but this makes me think that they have their priorities in order. Especially in the bubble that is ‘celebritydom’, to downsize might give the impression that they are on the way down. To buck the pressure to have a showcase home, and go for what they know will be best for their family, is just so refreshing. And it will be better, no doubt. I use to clean big houses, and I always thought that it can’t be good, to have your child in the home, and not even know they’re there, or coming or going. Size is very important when it comes to what makes a house a home. Way to go! I can only imagine how amazing it will be once she gets ahold of it! I have pictures of her bedroom and family room saved to my computer (pre-pinterest days!) Personally, I think it’s great of them to live more realistically! Funny that a girl who grew up in one of the biggest mega mansions could actually call a cozy place like this home. Quite refreshing…..But I wouldn’t be surprised if they added on. it’s easy to believe she’d go for something cozy. that mega-mansion was not about family. it was about being a hugely successful businessman in a showy town. candy spelling’s career was being her husband’s hostess. tori does not have that job so she does not need that kind of work space. and she has made it vastly clear how important family life is to her. i get very confused listening to them. when they bought the old house it turned into a big teary session about how they couldn’t get the house tori really wanted and dean felt he should be able to provide that. fine, that’s relatable. then we find out tori rents a warehouse full of so many home goods she decides to open a short term store to sell it off. ?!?! what’s with the poor-mouthing? her rental on that warehouse had to top my nyc rent. and they’re buying/selling homes in california in this economy? confusing. i’m sure they’ll trick this baby out though. that bedroom suite is interesting, but also kinda cool. you can use the sitting room as an office without messing with your sleep patterns. some simple renos, like raising the doorway to match the height of the bathroom doorway – or even closing it off and making the bed/bath one big room – are possible. clearly the last owner’s had no imagination. the place is barely decorated. that room with the floor-to-ceiling bookshelves and skylight… i’d buy it just for that. then put a daybed and cushions in their and make it reading central. That really is downsizing! 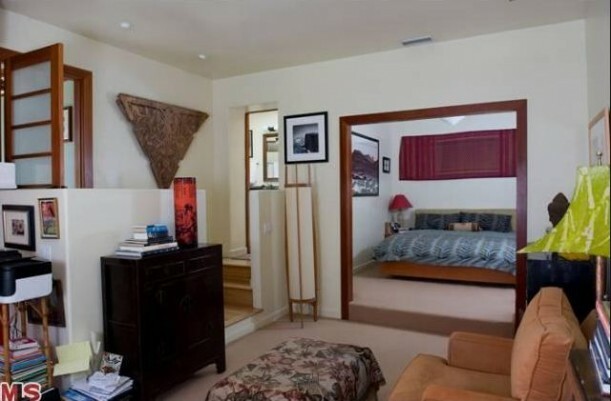 It looks like the bed area of the master bedroom is too narrow. I hope they don’t tear down this house but make the most of it. Is this the house with their stuff in it or how it looked before sold? I am confused. These are the mls photos with the former owners’ things in the house. Talk about downsizing! Not only is it a rather large downsize from her previous house but an astronomical downsize from the house she grew up in! I can’t help but picture the look of disgust on her mother’s face when she heard about this, lol. What is up with Hollywood and they’re constant moves? It’s like it’s their hobby or something. O good for her! You know me, I’m drooling over that bookshelf. How refreshing! I think this looks like a great “family” home that will produce wonderful family memories. I read her blog post about the vintage wood floors and they look amazing. Since she’s installing new floors in the house I doubt they’ll tear it down. This is wonderful. I’ve always been a huge supporter of smaller homes. Bigger doesn’t equal better when it comes to homes. Very interesting. It will be fun to see what she does to the house. You know Julia, I’m really, actually, impressed by Tori Spelling. Can you imagine being raised in all the opulence and then having too much, it’s taught her I think a lot about the downfalls of excess. I like how she wants her family in a closer space together than in a big house and feeling disconnected. I lived in a 5,000 square foot home and experienced the feeling of, you don’t really even feel when someone else is home. Kudos for her, she seems to have gotten her footing and is grounded and I hope and wish for her a happy life and can just imagine this house after she is done with it, the transformation it will take, sort of like her. In the world of rich spoiled heiresses like Paris H and such, Tori Spelling seems to getting to what is really important in life. Great post from you, again, Julia! Thanks for all you do. Kudos to them for downsizing. Mansions are so 1990’s;) Seriously I don’t watch their show, but after growing up in Spelling Manor I’m am pleasantly surprised. Hope there are after pics!! Good for them! This house is about the same price as the one she sold and this one doesn’t even compare. What a crappy looking house. I don’t know much about this couple but, I think they have the right idea. More people are downsizing and finding it to be so much richer than having so much. I rather like their new home over their previous ones. Much cozier. I love Tori! I haven’t seen her latest season up in Canada yet. I can’t wait to see what she does. Didn’t it seem like the previous owners had a sofa in every room?? Yeah, it’s nice that she’s moving into more of a humble abode but I WOULD HAVE NEVER LEFT THE OTHER HOUSE!!!!!!!!!!! The bed having its own room is actually a very nice touch. My bedroom is much the same and it makes for a very intimate and cozy place to sleep. Not a big Tori Spelling fan…..until now. This is so refreshing to read in this era of “bigger is better”. The fact that a celebrity can be so down-to-earth is really nice to see. My family lives in a home about the same size, with 3 children, and I will say that it is nice to have everyone close instead of living their own separate lives in different parts of a sprawling home. I love Tori & Dean!!!!! I loved there old house it was beautiful!!!! However This new house is so homey and cozy, they can have good old fashion family fun, and spend alot of time with the kids, plus room for all there animals and outdoor needs!!! W2G Tori & Dean!!!!!!!!!! Haters so posting!!!!!! This couple is in love and have a great family let them alone!!!!!!!!!!!!!!!!!!! Refreshing to see a celebrity couple downsizing instead of living in ugly oversize McMansions. This is a sensible house in a prime California location with rare acrage around it for privacy. They made a very smart buy. I grew up in Malibu and living in that area of beachfront, is magical and lovely. Her kids will be very happy there, its a great place to raise a family. Just like me her kids will grow up on the beauitful beaches learning outdoor activities and learning the true value in being a family. The house has interesting possibilities but it seems a bit short-sighted to have only three bedrooms. Brother and sister sharing a room with bunkbeds will only last a few more years. They will want (and need) a bit of privacy as they get a bit older. Perhaps the plan is to have both girls share the room in the future. Perhaps there is a plan to expand a bit to add a slightly larger master suite and give the children each their own room. It will be interesting to watch how they adapt the house to their changing needs. Seems like she is going out of her way to be the polar opposite of her mother. The house is ugly and looks almost like a double-wide trailer. Seems like it will be a little crowded with all their kids. Heck, even I had a 4 bdrm when raising our two kids – and I’m no celebrity. Of course here in Texas we get a lot more house for the money. That house, if located here would sell for about $150k. C’mon Tori…you can do better than that!! On the up side…at least they don’t have to worry about the kids wrecking anything. The house is in a great location, but I am sure that they will be adding on and remodeling. I can’t imagine that they – or any family of six (plus Dean’s older son) – will be comfortable in that house for too long. It’s funny to me that this is downsizing because I’m a small 1500 square-foot ranch in Virginia. So, 2300 SF in Malibu sounds pretty awesome! 🙂 But good for them for recognizing what’s important in life. I think too much credit us given to downsizing. As a top poster wrote, location, location, location. 2 acres in Malibu is real estate gold. They didn’t downsize, they tremendously upsized their real estate investment in this chic location, especially looking to the future state of the home after Tori’s eye for detail in design gets to it. But what also surprised as they went for Malibu… def more “Hollywood” then Encino!!! You need to update! They renovated (great photos) and are selling this house for 2.7 mil. Oh come ON people! 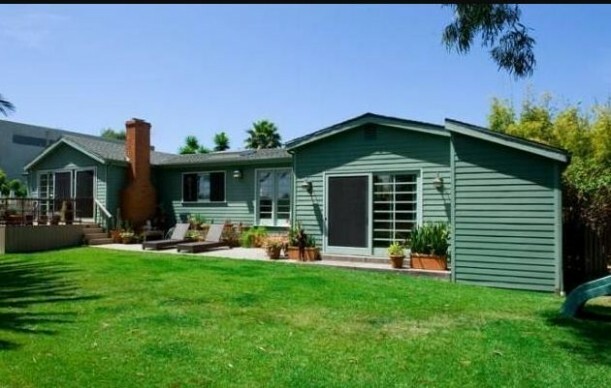 There is NO way in hell Tori would just downsize to a “cozy little house” for no reason, this woman is smart and savvy and didn’t want to come across as snobby or jeopardize the sale of the encino house. She is totally UPGRADING here to a better location and bigger land and you can bet your last dollar that she plans to expand or get the wrecking ball on this dump! Just wait and see…. I heard her father only left her $800000 in his will. Not much to live the high life on. Though I don’t think that would bother Tori too much she seems very down to earth. The house is fine she’ll probably upgrade when/if her mom leaves her some money.